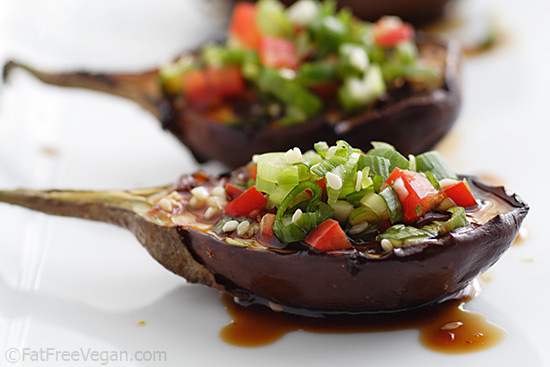 Homemade Korean barbecue sauce adds the sultry flavors of sesame and ginger along with sweet and spicy notes to grilled baby eggplants, but it’s also delicious on tofu, tempeh, or anywhere you love barbecue sauce. Blame my husband. Normally I wouldn’t post back-to-back eggplant recipes, but while visiting his family in New Orleans, D took a shopping trip to the Hong Kong Market and brought home the last thing we needed, more eggplant. 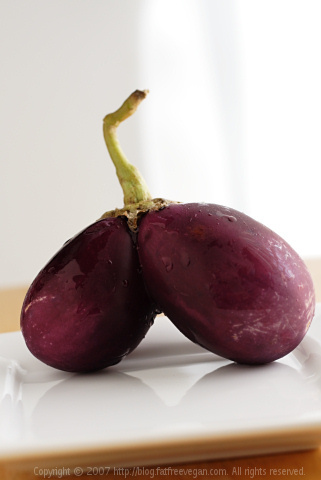 But he knows how much I love baby eggplants, so he and E couldn’t resist buying them for me, even though we’re up to our ears in their longer, thinner Japanese cousins. They also couldn’t pass up the opportunity to bring home this cute double eggplant. They know me so well that they assumed I’d want to take photos of it, which of course I did, before reluctantly cutting it apart. But what to do with the eggplants? They’d brought home a whole bag of them, in sizes that ranged from smaller than a golf ball to almost as big as my fist. I knew that I needed to watch them individually as they cooked so that I could remove the little ones before they got overdone while letting the big ones cook longer. And somewhere along the line I got these visions of grill marks dancing in my head, which was really inconvenient with the temperature outside at 104. So against all sense and reason, we started the charcoal and prepared the grill. Earlier in the day, I made the Korean barbecue sauce, marinated some sliced tofu, and made Mung-Bean Salad from D’s other major Hong Kong Market purchase. It was ridiculously hot over that grill, turning eggplants and tofu every minute or so to prevent them from burning. And I will not lie to you. By the end I was hot, smoky, tired, and cranky as hell and wished I’d just roasted them in the oven. But as we sat down to eat in the lovely air conditioning, it seemed almost worth it to savor the smoky flavor that you can get only from grilling. That doesn’t mean I’ll be doing it again any time soon! Grilling baby eggplant is easy because there isn’t a lot of slicing involved. Simply cut the eggplant in half. You can even leave the stem on and cut it in half, too, though most people remove it. 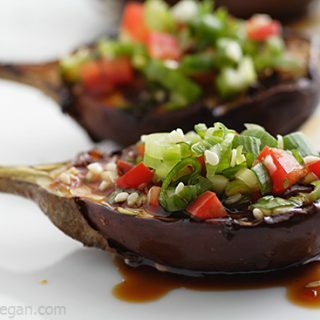 When the eggplants are done, arrange them on a plate, drizzle them with Korean Barbecue Sauce, and serve topped with the optional Spicy Green Onion Garnish (recipes below). You can, of course, buy this wonderfully sweet and savory sauce. In fact, I have a whole jar of it in my refrigerator, but homemade is really tastier and not filled with thickeners and preservatives. See the notes for the recipe for the garnish. Place all ingredients except the sesame seeds into a small saucepan and bring to a boil over medium-high heat. Reduce the heat to very low and simmer until partially reduced, about 15 minutes. Remove from heat and add sesame seeds. Sauce should thicken as it cools. To use, warm slightly and serve over vegetables and tofu. Makes about 6 2-tablespoon servings. For best color, make this right before you plan to serve it. Finely chop the green onions. Mix them well with the remaining ingredients. Serve over eggplant or other vegetables. Tis the season to grill eggplant! If you’re looking for more recipes, check out Kalyn’s Spicy Grilled Eggplant with Red Pepper, Parsley, and Mint. 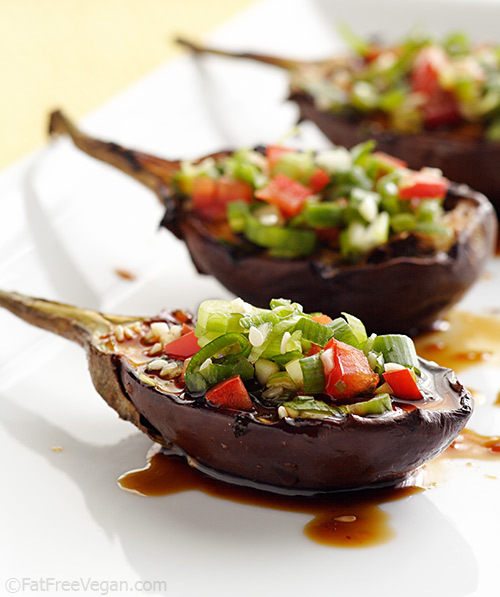 As an added bonus, she has links to 10 more grilled eggplant recipes from other bloggers. I think this is the recipe? Am I right?? Thank you so much for this recipe. I happened to have Korean left over and bunch of eggplant, this is perfect, super easy, and a big hit! I made this today…with a couple of changes. Firstly I slices the eggplants and sliced four slices of tofu. I brushed these with a tiny bit of oil and then cooked them on my griddle pan. I served it over brown rice. I’ve taken some photos and they are on my blog with a review of the recipe. I really enjoyed this recipe Susan..as always…thanks..